Between the cooking and the serving, that’s where Carter-Hoffmann fits in. They have been pioneering and manufacturing solutions for the foodservice industry since 1947. From their beginning as a small welding shop specializing in stainless steel fabrication and invention of the first banquet service carts, Carter-Hoffmann has grown into a leading supplier of commercial foodservice equipment with products for holding and transporting. Today, the world’s leading hotels, resorts, chain restaurants, healthcare facilities and institutions rely on Carter-Hoffmann equipment to deliver their meals efficiently, safely, and kitchen-fresh. Hold French fries, crispy chicken tenders, poppers, in-shell peanuts and more! 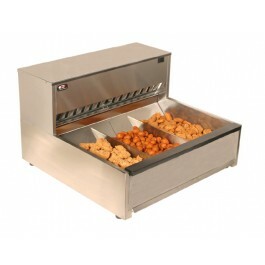 Gentle hot air circulation over and through the product maintains crispness while keeping food hot and ready to serve! Reduce food waste by extending the hold time for up to four times longer than traditional methods, such as heat lamps and enclosed holding cabinets. Gentle air circulation to maintain warmth and crispness – draws air across and through product for optimal temperature and texture. Heating elements and components located away from oils and vapors. Large landing zone with adjustable and removable dividers for flexible product holding and easy cleaning. All stainless steel construction with removable product tray and grease filters for easy cleaning. New VCNH3W2S-CVR cabinet with integrated pan covers for flexible holding of not only crispy foods… but moist foods too!